Disclaimer: My hair is super boring. On any given day, you can find it worn one of two ways: down and straight, or up in a messy bun (and not a cute messy bun — just messy). This isn’t because I hate my hair; I actually think it’s pretty, strong, and healthy. Instead, I have a problem with getting out of bed in the morning. So, if I roll out of the house in say, 15 minutes — from bed to car — and my hair looks OK as is, that’s how it’s going to stay. Then, I get to work. Here’s where I begin to regret my morning laziness. My coworkers spend more time on their hair than me. I know this because not only do they look fabulous, but I also hear them talk of blow dryers, curling irons, and time spent braiding and updo’ing in front of their bathroom mirrors — routines that all happen before 8 a.m. And since I work in the beauty industry, creative hair is everywhere. You can’t attend a single event without spotting the most gorgeous updos, Angel waves, or intricate braids. So, it was only a matter of time before my name was pulled for a hair dare. Click here for the 7 Days of Outrageous Hair Flair. After reporting on all the hair flair on the runways of this year’s Mercedes-Benz New York Fashion Week, the staff has been obsessed with hair accessories. 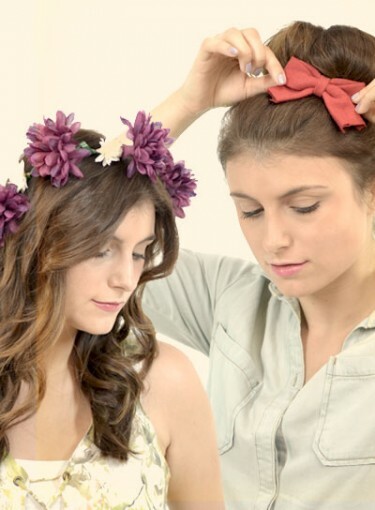 Floral crowns, turbans, bejeweled headbands — you name it, it’s on our radar. After weeks of gushing about the best hair flair, my coworkers stuck it to me: Wear different hair flair for an entire week. I know it doesn’t sound like a big deal, but for someone who barely brushes her hair in the morning, this is kinda intense. (And by kinda, I mean very.) First concern: I’ll look like a fool. Maybe if I ate at my desk all week, made limited bathroom breaks, and never left the office for coffee, I could pull this off. Too bad that monk-like existence doesn’t really work for me. Second concern: Seven days is a loooong time. Could I really do it? No one likes to fail at a dare. In the end, I agreed to the challenge. As for what happened? Keep clicking.